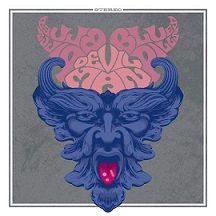 Review: "Blues Pills: Devil Man" - Sea of Tranquility - The Web Destination for Progressive Music! The latest darlings of the Nuclear Blast roster are sure to be this fascinating American-French-Swedish combo that call themselves Blues Pills. Citing influences as Aretha Franklin, Led Zeppelin, Cream, Jimi Hendrix, Peter Green era Fleetwood Mac, and Janis Joplin, this quartet probably sound like what a midnight jam session between Beth Hart and Graveyard would result in. Vocalist Erin Larsson has an incredible voice that is firmly rooted in the blues, and she's just dripping power, passion, and emotion throughout these four heavy blues-rock songs. Just listen to her wail on the gut wrenching "The River", or stab through the heavy rock sounds of "Time is Now" and "Devil Man". Guitarist Dorian Sorriaux knows all the tricks of the trade, as he's obviously studied his Page, Iommi, Clapton, Hendrix, McCarty, and Beck licks quite well, delivering scorching solos and meaty riffs throughout, and the rumbling rhythms from bassist Zack Anderson & drummer Cory Berry hold down the fort nicely. "Dig In" shows all four in fine form, as Larsson's sultry vocals smolder over some smoky '70s era blues rock arrangements, including a fiery wah-wah laced guitar solo from Sorriaux. This little EP is scary good, and serves as a mouthwatering teaser for what is sure to be a superb full length from this band in the very near future.